The warmer temperatures have arrived in Sacramento. 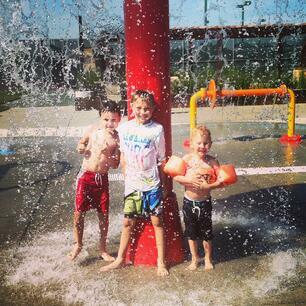 With that happy announcement the splash pad has turned on at our local Cal Fit in Elk Grove. This makes my children (and mama) very happy. This outdoor play feature is one of our favorite amenities of our family gym membership. 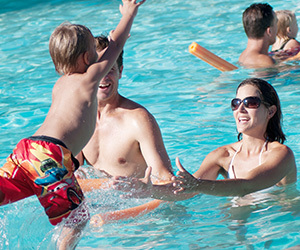 As a family, we enjoy spending many hours, during our summer, splashing and playing in the outdoor pool area. The boys enjoy using their imagination as they run (walk!) quickly from one splash feature to the next… and ultimately jumping into the nearest pool. I love that we have access to all the California Family Fitness gyms with our family membership. When (if) we tire of our local gym’s outdoor pool and splash pad we can load up in the van and explore a new-to-us gym and splash pad. This feature is one of the features that our family loves the best, besides the amazing child care. Many Cal Fit gyms feature a separate kid-friendly pool where the depths are consistent, so you don't have to worry that they'll suddenly step off into water over their heads. Adjacent to each pool is a spray garden where kids can run around fun structures that continuously spray water - it's perfect for older children who have been in the pool too long as well as little ones who may not be ready to go swimming. Cal Fit also provides swim lessons. I personally do not have experience with their swim lessons, but have heard great things from my friends who have. My family and I are thrilled that the warmer temperatures are here. We are also excited to spend a lot of time exploring and playing in our outdoor pools and splash pad features at Cal Fit.